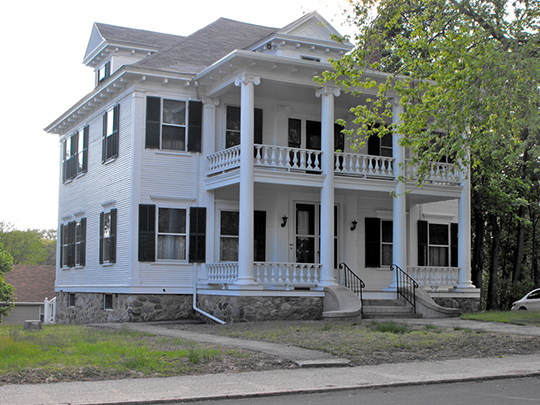 Methuen City Hall is located at 41 Pleasant Street, Methuen, MA 01844; phone: 978-983-8515. Photo: Terrance Dolan House, ca. 1900, 478 Prospect Street, Methuen, MA. Listed on the National Register of Historic Places in 1984. Photographed by User:EraserGirl (own work), 2008, [cc-by-2.0 (creativecommons.org/licenses/by/2.0)], via Wikimedia Commons, accessed October, 2015. During the 17th century, the settlement was comprised of scattered farmsteads. Land in the eastern section was granted to a group of proprietors who gradually subdivided and distributed their land into private ownership. A smaller portion in the west was granted in large tracts to individuals. There were few settlers in Methuen until it was set off from Haverhill and chartered as a separate town in 1725. Less than 200 people inhabited Methuen at that time and few buildings are documented from this early period. The physical form of the community began to take shape in 1727 with the construction of the first meeting house on Meeting House Hill (later known as Daddy Frye's Hill) in the southwest portion of town. The earliest extant map of Methuen dating from 1806, when the population numbered about 1,400, illustrates physical growth patterns of the previous century. Methuen continued to be a dispersed agricultural settlement with a few cottage industries, including shoe making and hat making. It was during the early industrial period (1800-1850) that Methuen developed a nucleated center, finally concentrating economic, cultural and residential activities. The City of Lawrence, incorporated in 1847, took the southern triangle of land along the Merrimack River from Methuen, leaving the town with its characteristic butterfly shape. Lawrence quickly surpassed Methuen as an industrial center, but Methuen continued to expand internally. The establishment or expansion of three major cotton or woolen mills coupled with a substantial residential and commercial development dominated the period of growth from 1850-1885. As Methuen acquired an elegant residential area, substantial mill buildings were constructed at the town center near the Spicket Falls. Architecturally significant is the Methuen Mills complex, with buildings dating from 1826 to 1882. During the period from 1885-1920 Methuen saw residential growth and the development of great estates. The electric streetcars effected a profound change in Methuen's spatial definition and growth process. Streetcars were extended from Lawrence in the 1890s, and this convenient form of transportation made possible the promotion of Methuen as an attractive "suburban" residential area for the City of Lawrence. Beginning about 1920, the automobile began to appear in significant numbers and further connected the process of physical change to modern transportation modes. Expansion of housing areas beyond the urban center continued in the 1920s, often using the moderately priced Bungalow style. Side streets branched off older roads at the edge of central Methuen, but proximity to downtown was still valued, as proven by the number of houses in central Methuen which were constructed in the early 20th century. Suburbanization accelerated after World War II, and then whole subdivisions were plotted off older rural roads. Extensive exurban growth was established for the first time in the community's history. The increase of population to 38,00 by 1980 was facilitated by the previous decade's completion of I-93 to the west and I-495 to the south. These highways linked Methuen more closely to the Lowell–Lawrence area, and significantly, to the population centers of the north shore and Boston metropolitan areas. Candace Jenkins, Preservation Planning Director, Wendy Frontiero, Preservation Planner and Carole Zellie, Landscape Research, Inc., Methuen Multiple Resource Area, Essex County, MA, nomination document, 1983, National Park Service, National Register of Historic Places, Washington, D.C.